Chapel Ridge of Council Bluffs, Iowa is the perfect place to call home. With our beautiful clubhouse, fully-equipped fitness center, and sparkling swimming pool, residents will find everything they need close to home in order to relax and recharge. Homes feature large walk-in closets, well-equipped kitchen, as well as a private patio or balcony. Call us to schedule a tour! 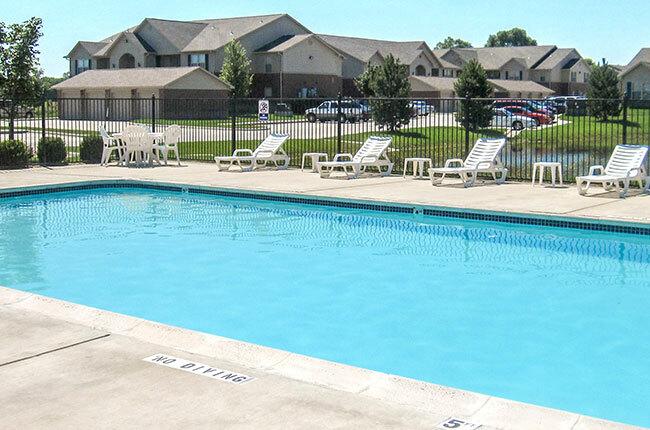 At Chapel Ridge of Council Bluffs, our central location offers both tranquility and access to the larger metropolitan area. Comfortably nestled in the quiet, residential neighborhood of Manawa, our community features beautiful, green surroundings with Manawa State Park, Gifford State Forest, and Fox Run Golf Course in the area. Metro Crossing Shopping Center is located nearby, with area shopping and dining options. In addition to all the conveniences right outside your door, Downtown Omaha is a short drive, as well.